Just four suites nestled into the rugged Aravallis is the Mountbatten Lodge, said to have been inspired by a popular lore that believes that Lord Mountbatten once camped here. You can also undertake activities like horse riding, sunset safaris and treks to Kumbalgarh, but it is the Jazz sessions at the bar that will keep you coming back. Mountbatten Lodge was built to reflect the British penchant for the wilderness with no compromise on space or luxury. The suites here are set in two bungalows – each bungalow independent and private, with a lounge leading to the two suites as well as a pool, verandah and sun decks. Each suite is massive, with high windows, beautiful bathrooms and large beds and couches that make up for a very inviting, comfortable and private space. Dining at Mountbatten Lodge is an opulent affair. While lunch is usually served under an ancient banyan tree and dinner is laid out with candles and flowers, and each cover is set to perfection for that dreamy meal to be served course upon course. You will definitely be tempted to go that additional mile to dress for dinner. The Lodge is also a perfect base to explore small villages and communities nearby. One can try horse riding, track leopards and even trek to Kumbalgarh, but for lazy vacationers like us, just exploring the property would be more than enough. 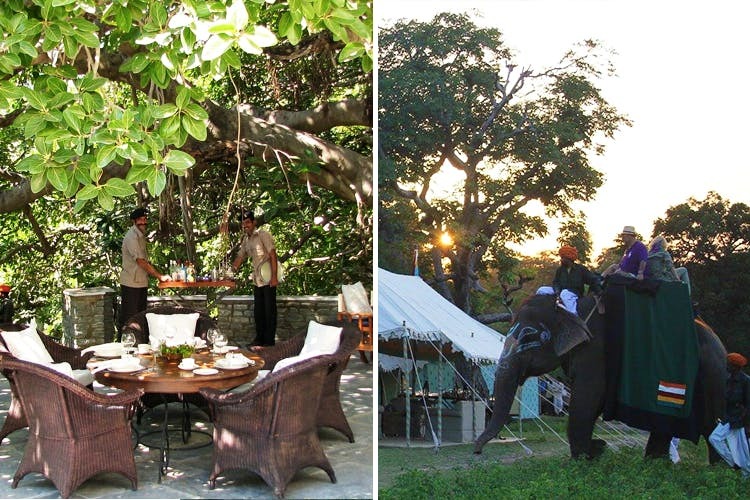 Mountbatten Lodge is located between Udaipur and Ranakpur, so it makes for the perfect long weekend getaway. Go on, pamper yourself a little! Price: Starting at INR 30,000/night. Book here.